Our Wedding Candy Bar Favors and Candy Bar Wrappers are a great addition to any Wedding reception! A Wedding is such a SWEET occasion and chocolate makes the perfect Wedding Favor. 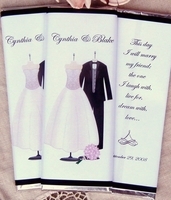 Treat your guests to a chocolate bar covered in one of our exclusive one of a kind Wedding candy bar wrapper designs. 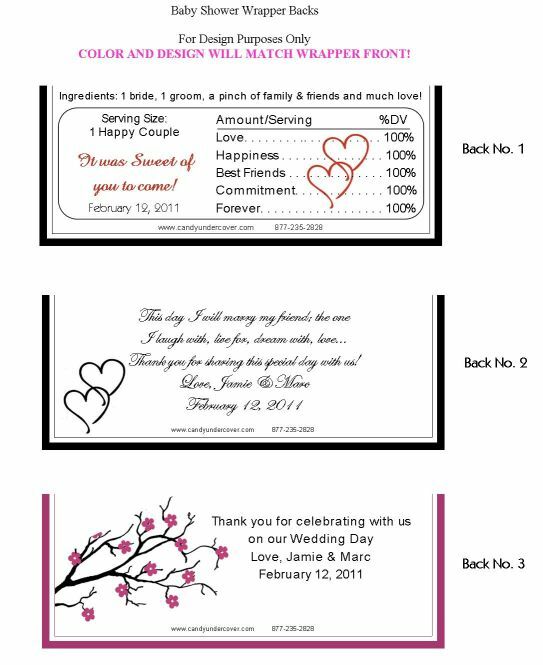 Our Wedding candy bar wrappers can be custom made especially for you FREE! We will add a photo of the happy couple also FREE! DIY! Do it your self! You can order the Wrappers Only if you are up to the challenge, or sit back, relax, and let us do the wrapping for you. Either way, you will treat your guests to a delightfully tasty personalized Wedding chocolate bar covered in a beautiful custom wrapper. 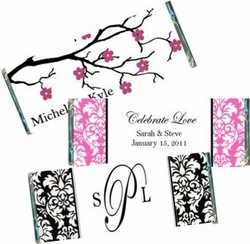 We will custom design a one of a kind Wedding candy bar wrapper for you FREE! We can add a photo to any wrapper for your FREE! We email you proofs of your wrappers FREE! Order is quick and stress free! Please contact us if a custom candy bar wrapper is what you had in mind! Email us at info@candyundercover.com or call us toll free at 877-235-2828 and we will gladly assist you.